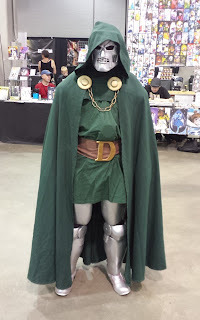 This past weekend I’ve vended at Eternal Con which was held at the Nassau Coliseum on Long Island, NY. Usually I’ve tabled at out-of-state conventions so it was a relief to only have a twenty minute drive without tolls or multiple gas tank refills to sell my funny books! And believe it or not, one of the best things about this show were the well-cushioned chairs that were provided to us. A welcome change from the hard plastic torture devices you usually get. My buttocks were happy! My table setup is pretty simple – comic books, prints, and shot glasses for sale. No lofty shelf systems to obscure my neighbors’ tables (there’s really should be a height limit on those) or boxes to step around to get at the good stuff. Just easy access to comic books with simple descriptions on post-it notes on the covers to explain what the book is and why you’ll love it! And usually that’s all you need to make a sale. Sometimes a quick answer or two to prod the customer along the way (“Who’s this guy? What does she do? What’s his name? What kind of monster is that?!) which I am always happy to provide! Sales went well at this show. 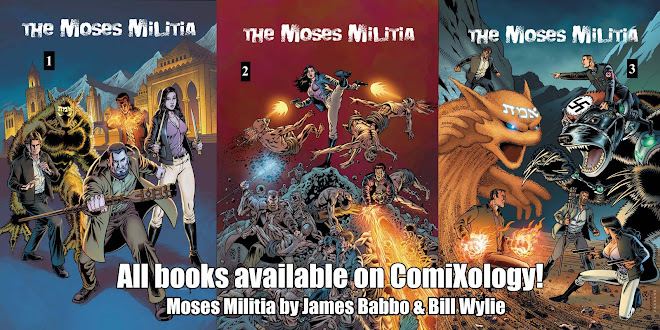 Customers bought complete sets of THE MOSES MILITIA, my World War 2 series, as well as GOLDENGIRL #1. A few prints sold and to my surprise, one guy bought four Moses Militia shot glasses. I guess he has some serious drinkin’ to do! If I had one complaint is was the lack of coffee at the show. No one had any but people kept walking by drinking out of copper mugs, taunting me mercilessly (in my mind anyway)! A vendor was selling these metal mugs with an added gimmick – free soda fill ups all weekend). That’s nice and all but I need coffee to fuel me. To my shock, beer was readily available. I saw guys walking around with open cans (really awful beer for my tastes) which I was surprised to see at a family event. But no coffee?!! Ugh! One of the fun parts of a con is just merely discussing comics with people. 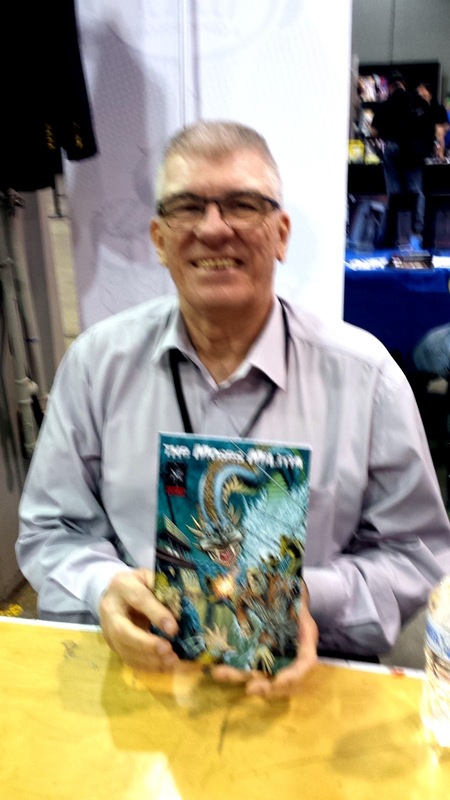 Had enjoyable chats about the Thunder Agents (not realizing until I got that it was Wally Wood’s birthday! ), Tomb of Dracula, Wonder Woman, & other books. Another major bit of enjoyable for me is talking with professionals in the field. My main incentive for vending at cons is to network with publishers, editors, and experienced writers and artists – for critiques of my work or to find freelancers to potentially work with in the future on my projects (within my painfully small budgets, of course). Lo and behold, I was pleasantly surprised to find Jim Shooter (writer/editor previously at DC, Marvel, Valiant, etc) sitting right behind me. We chatted about his Avengers run - specifically his two part Molecule Man story which I loved. During the course of our chat he asked about my stuff of which I was happy to give him a copy of the latest issue of The Moses Militia. On Sundays, typically I like to bring in Dunkin Donuts munchkins to give out to my fellow vendors. People are usually tired and grumpy but you’d be surprised how far a tiny little pastry will brighten someone’s day. As an added bonus, people will remember that small gesture. 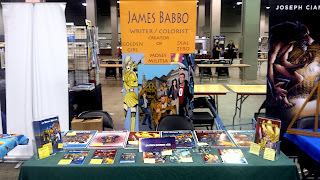 Pro artists were coming over to my table to thank me, look over my books, & provide advice. Having an established professional tell you that you’re doing quality work is a great feeling. Maybe you’re not ready for the pros yet but you’re on the right track. It keeps me going forward. There were a lot of cool cosplayers in attendance notably a great looking Dr Doom. Of course, I need to mention the main guest at the convention – William Shatner. As a friend pointed out, he looks like a cuddly teddy bear, round with curly hair but as another person described, “A teddy bear that doesn’t want to be touched.” And I don’t blame him. The guy is 87 years old. Leave him be. And one point, he walked right past my table (fast enough that I wasn’t able to get my camera out in time). To me, it’s such a reality bender to see such an iconic figure in real life. Was so happy to see him in person within arms’ length. So a very enjoyable experience. I would do this convention again but now I’m in preparation for Baltimore in September. Back to work on the next issue of MM!